Pinterest has been my top referral site for some time now (after Google of course) and I only really started using it properly just this year even though I've had it for around 3 years since I started my blog back in 2012, I mainly used it for my own use and not for blog promotion. I don't have a big following but I do get a lot of traffic from Pinterest and this is all down to doing some of these things I'm about to share with you rather than just re-pinning tons of pins to random boards. Not only is Pinterest extremely addictive it can really increase your blog traffic if you use it strategically. One thing I hadn't actually realised is that Pinterest is in fact a search engine just like Google, so your content gets better over time as it will keep on going and be re-pined when new people come across your content. Here are my tips for using Pinterest which you can start implementing right now to increase your blog traffic, following and re-pins. Decide who you are pinning for...whether that be food lovers, home and interior lovers, bloggers seeking blogging tips and advice, people looking for kids crafts and meal ideas. You need to decide who your target audience is. Try and stick to what you currently blog about, and not just all of your own interests, think who your followers are and what are your readers looking for on Pinterest. To give you an idea, I'm pinning for bloggers and small business owners who are looking for tips and tools to build their blog or business. I also have various other boards which are popular such as home interiors, recipe boards as well as toddler and parenting related ones as I also blog about these topics. - Easy to read text with blog post title on the image.Use 2-3 fonts for headings, subheadings and text font on your images. Be consistent! - Stick to 3-5 complementary colours that match your blog or brand. When people see the same style posts they will start to recognise you and be curious to click on your pins. Before I started using these tips I would only actually make the odd image pin-able by adding text however I have recently started making more of my posts pin-able and have noticed a huge difference. If they're not visually appealing, people aren't going to be clicking on them. Vertical pins get seen more and will attract readers to click. If you go and look at your feed right now you don't really notice the horizontal ones at all. Make sure yours are vertical! If you post a lot of recipes or tutorials then long and skinny pins like this one are great for grabbing someone attention as they take up more space on your feed. Once you have great content to be pinned it's time have a great profile to show off and become a recognisable brand. Anything "above the fold" is what your readers will see first and you want it to show off your brand/blog and what you have to offer. After all first impressions are everything. As you can see my first 5 boards are to do with blogging as that's my passion and I have my own blog board there too. I'd recommend having that as your first board with your blog name as the board name. You can see my name is shown as " Kerry | Business + Blogging" as I have a lot of boards related to this which I want people to find easily. If people happen to be searching Business or blogging tips my profile will come up for them to view. If you have a travel blog for example, you could put "Travel+Lifestyle" after your name or blog name so people searching for posts in that niche will find your blog. If you blog about home and interiors add that into your profile name and you can do this with what ever your niche or passion is. Ensure your cover images represents your brand and what the board is about. Whether that be colourful, a text image or pastel, just insure to keep theme in theme. Especially the top 10 boards as those are the first ones someone will see when they click on your profile. You should also name your boards correctly, name them things people are searching for. These should be SEO keywords i.e "Parenting Tips", "Home & Interiors" rather than just "Pretty rooms" or "Parent life". Also don't forget to add descriptions to your boards. I see so many people who don't do this and are loosing out on so many potential clicks! I use about 5-10 keywords in my descriptions as they will all come up in searches too! For example if the board was about food for kids then you could add the keywords shown below. You don't need to write sentences, strong keywords work fine! You want to organise your boards strategically, have your most popular ones at the top or the ones which represent your brand or blog. You should have a minimum of about 5-10 boards in your profile, but remember if you have too many boards sometimes this isn't actually helping as people aren't sure what your focus is. I recently deleted over 30 boards and I still have more I want to delete and organise to narrow it down to my niche. Just note that deleting boards also deletes followers if they have only followed your board and not your profile, so perhaps start with the boards with less followers. I lost around 3000 followers by deleting boards, but these followers weren't targeted to my niche so that's okay, after all we want people who like what you like too. By having rich pins on your pins, you're able to add keyword-rich descriptions, your website name shows as "pinned from" along with your logo and the title of the post shows up in bold which you can see above. You may have seen some of these whilst scrolling down your feed and wondered how they got their pins like that. Well now you know. This creates brand recognition and makes it much easier to click straight over to your blog. You can apply for rich pins here and you'll need a business account. You'll have to wait to be approved but it doesn't take long, I was approved within a couple of hours. This is something I've only recently started doing this past month and already I've noticed a huge difference and have had over 10,000 views just from these rich pins. You may be wondering why would you want to be deleting your pins if you are trying to promote them. Good question! The answer is simple. If you have hundreds of pins with a low re-pin rate or have never been re-pinned at all then you will have a low user ranking. By deleting these pins you are telling Pinterest that people are liking what your pinning, but you can trick Pinterest by deleting these pins and re-pinning them again to see if they get more re-pins! Start by deleting any pins with 0 pins and that are off-brand to your blog or anything that you're thinking why the heck did I re-pin that? Remember you can also move pins to secret boards if you really want to keep them but they don't fit with your brand. You may also want to delete links with broken or bad links as this will also lower your internal user ranking with Pinterest if they're not leading your readers anywhere, after all Pinterest is looking for the highest quality pins to share. You can use tools such as Pin Doctor to search all of your pins for any bad links which will scan all of your pins for as little as a penny a pin! If you have pins which aren't sending people anywhere they're a waste of space! If there don't have links, add them in. 15 minutes each week to do! Yes just 15 minutes! I use BoardBooster to do this and set up my pins each week which will then be re-pined every single day. My page views have doubled since scheduling my pins. Its really time-saving and effective. It isn't free and is about $30 (£15) a month or you could use other various plans from just $5 per month but if you really want to see results I'd recommend the $30 plan which gives you 3000 pins a month which is roughly 100 a day. BoardBooster works by taking pins from your secret feeder board and pins them. There are other scheduling programmes for Pinterest such as Tailwind, Buffer or Viraltag but none of these loop your pins which is what I love the most about BoardBooster as I don't need to sit and add the pins daily. I do still re-pin a number of posts manually from Pinterest itself as I still like to browse my feed daily to see what new content is out there. Looping your re-pins is a great way of getting your old content seen. It takes your oldest first and re-pins them onto your boards so as your following grows your pins will get pinned more and means you don't have to find new content to post each day! I have many of my boards set to share a pin 5 times a day and some others just once. Group boards are great for promoting your blog content as well as finding new blogs to read. They're a great way to get your content out there and to new people. Make sure to only join groups which are relevant to your niche and pin to them as often as you can following the group rules. You can find group boards by searching for a specific keyword on Pinterest and filter by clicking on "boards" and all of the groups are listed with the group board icon in the top right corner. If you're looking for a blogging tips group to join I run one here. Don't just join any group boards, you need to join around 3-5 group boards which are relevant to your blog. Aim to join groups which have a lot of followers which are frequently pinned to so people are seeing your content. You should join groups where pins have an average on around 3 re-pins as this shows that the pin are getting pinned. Don't forget to share other peoples content other than just your own, try and pin at least 2 other pins for every pin of your own if allowed. Add these groups to the bottom of your board section on your profile. If you're wanting to find groups relevant to your niche or blog take a look at Pingroupie.com or create your own. Also you could check out the analytics to see which boards are the getting the best results and are actually worth pinning to. So you've now got a great Pinterest profile and are pinning great content but you've noticed that not many of your pins are actually getting pinned from your blog. Don't have a pin it hover button on your images? Then install one! Make it easy for your readers to pin your posts! Many buttons are included with most templates these days however if you don't have one then read this post here on how to create and install your own. So many blogs I come across don't have the option to pin an image, which results in them loosing out on so many potential pins and more traffic. If you're not giving people the option to pin with a simple click, they're not going to bother going out of their way. Sounds pretty simple right? Also, don't forget to add a follow button for Pinterest in your sidebar so your followers can follow you there too. You could also add a widget for your profile or a popular board. Follow some new people who are in the same niche as you. Type in "Food blogs", "Blogging tips", "Fashion" or whatever type of blogs you are looking for and click on the "pinners" button which will display blogs in that niche. I like to do this at least once a week but I do also follow someone if I come across a pin of theirs that I like. These definitely aren't everyones cup of tea but sharing threads on Facebook groups are a fantastic way of getting your content re-pinned and potentially go viral! If you join a Pinterest thread where 50 people have added their pins to be re-pinned and everyone completes them as per the rules, thats 49 re-pins! Which will then potentially be re-pinned by others, show up higher up on more timelines and drive more traffic to your blog. Have some great pins which are getting lots of traffic and re-pins but you're rather embarrassed by the image you made a couple of years ago? Take a look at your analytics and make note of your most popular pins and go through your old posts and re-do your blog images, make sure they follow the tips above in step 2 is become awesome pin-able pins. I've recently, went through all of my most popular pins and have started re-pinning these to match my current brand image and have noticed a huge increase in the amount of times these posts have been seen already. - Make sure you're adding alt text to all of your blog images so when someone pins one of your posts it will save the text you have typed up for that image. - Pin high quality on brand content. You want people to start recognising your brand. - Add a call to action! - Tell your readers what you want them to do..."click through to read more", "click this pin to find out how to.." descriptions like these will give readers a little push to click over to your blog. You may also find the Pinfinite Growth e-course by The Nectar Collective extremely useful, it definitely helped me find my niche and increase traffic to my blog. I hope you found this post helpful. Do let me know if you start using any of these tips, or if you do already. Do you have any tips to share? thanks for sharing, Ive spent all day sorting buffer and IFTTT and now optimising the blog, this will be next on my to do list! So much work running a blog! Oh Kerry I love all your knowledge and this is really gave me a things to think about as my pinterest is my weakest point and hardly have anyone ever following repinning on mine. I really need to up my game with it. Thanks for sharing your wits. Thanks for the good tips. I'm addicted to Pinterest but didn't know you could do so much with it. Thanks for these really good tips. I'm just starting out using Pinterest and your blog post has helped to shed some light on things. Kerry these tips are amazing! Thank you for sharing! I'm terrible with Pinterest, I've just used it for myself rather than my blog. I think I probably need to start a new account purely for the blog as it's more niche than my interests. Thank you so far I have gained no traffic from Pinterest so I am thankful that I now have handy tips to optimize my pinning skills. It first started out as a hobby way before I had a blog and now I am blogging I really want to drive traffic to my blog. These are great ideas! In particular, I need to utilize my profile name better. I'd never thought that it could help people just clicking through to know that you pin what they're looking for! So smart! Great post!! Lots of wonderful information. Definitely sharing this one. These are fantastic tips! Who knew Pinterest was so complicated? Wow...I did not know about deleting them..lots of new info here....thak you so much!! Oh my God kerry. You put so much thought into this. It must have taken your forever to write this post. As always it is very helpful. I generally only use pinterest for my own personal use but I do have a board for my blog which I called the name of my blog. Not really practical but I don't necessarily want it linked to my blog. I've been wondering more and more about this. Most of my social media focus was on Instagram for the longest time. Pinterest is where I am trying to develop the most now. This helps so much. I write about travel and style tips so creating more clickable images I think will help a lot. Pinterest is one of my top referrals as well. I need to look more into Rich Pins! Re-doing my pins and adding attractive "pinnable" images to old but good posts has driven lots of new traffic. Pinterest is a top referrer for me as well. just apply kerry's idea and tricks on your blog. its really works good. I also applied to my one also and got major traffic through it. Wow, this is so helpful, thanks for sharing all your knowledge. I love Pinterest but hadn't put any focus into using it to promote my business or blog so this is really useful for me, will definitely be bookmarking this! Love this, though going to have to do a lot of work on mine, as it is mostly of ideas of the kind of home I would love to have, so saving all the various ideas. 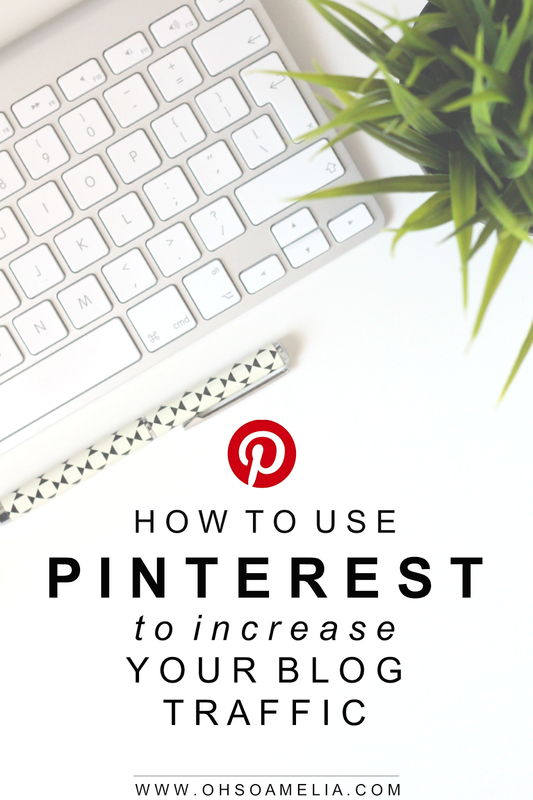 Thank you for sharing such a useful post, helping bloggers make more of pinterest. I need to work on my profile. Thanks for the reminder. These are all such great tips! Thank you! I've been ramping up my pinterest game and I've definitely see a pay off in traffic! I keep coming back to this post when I've got a few minutes for Pinterest. I can't wait to have more time to dedicate to it! really great post, I spend all the day to read it in depth and really impressed with your blogging tips and idea about increasing traffic through pinterest. I loved your all topic which help me to increase followers as well as traffic too. I optimized your idea to my blog and other projects also and got effect also..
Really again thanks for your this great post, love to here all your regular posting. Thanks for going so in depth with the post. Gave me a few new tips that I have already put to use. When you loop pins do you erase them and add them in your "secret" boards for Board Booster? Outstanding blog post, I have marked your site so ideally I’ll see much more on this subject in the foreseeable future. Afraid OF Buying Backlinks From Fiverr ? Pleasae Try Us We Always Deliver Quality Fiverr Backlinks Or You Will Get Your Money Back Guaranteed. WOW! This is very Nice and well mention Post Which clear my concept for Drive Free Traffic by Pinterest and I applied this on my way and got amazing results which demo is here that How i got FREE Traffic by Pinterest . Thanks for this helpful post, I have been looking to find a way to grow my traffic through Pinterest. very useful ! thank you so much!!! just found this jewel and it is very useful! thank you for the tips! I’m a total geek; I admit it. SEO to me is like chocolate to you. I love it and the more I learn, the more the love deepens. I"m Corey Edward from US Florida..This is my testimony on how my ex girlfriend come back home..i want to say a very big thanks and appreciation to Dr. Trust for bringing back my lover who left me. One day as i was browsing searching on the internet for recommend spell caster who will help me to bring my Ex Girlfriend back,Finally i met a writing how so many testimony talking about Dr. Trust who restore relationship back,so i email him and he cast the love spell,luckily within 24 hours my Girlfriend really called me and started apologizing for all she had caused me.and begging me to accept her back and we are living happily and our relationship is now very strong, I am the happiest man on earth today because Dr. Trust has done a wonderful deeds,my Gf now love and respect me. Email him for your relationship help. I love this advice! EXCEPT the "delete pins". I've had several clients with pins that have 0 or 1 repins and then several months later the pins pick up traction. For example just a few weeks ago a client had a pin from last year that had ZERO repins, well it got pinned and repinned and it translated to over 200,000 pageviews in under a month - yes, just that ONE pin that most people would have deleted. DO NOT DELETE PINS! This was a fantastic blog post. I found it super helpful! Hi! I was hoping to find out which picture editor you use to create your vertical images to post to Pinterest. I haven't found a program that is as comprehensive as I would like to be while still not costing the amount of Photoshop. Hiiiii!! my boyfriend and I have been getting into little arguments which then later escalated. A lot of which are my fault but I never thought I would lose him because we are in love. He told me yesterday that he loves me but is done. That the fights keep hurting him too much. I can’t believe I hurt him like that and would love nothing more than another chance to prove to him and myself that I will cut out my insecurities that I’ve brought into this relationship. I did all i could to end this fight between us us, didn’t work so i had to seek the help of a spell caster who i met online and promised to help me bring him back into my life in 2 days time. i wasn’t really sure about this, but i was really desperate that i had to do all that the spell caster asked me. it was on the second day at 5pm on Friday, i had a knock on the door and to my greatest surprise, it was my boyfriend, the first thing he said, was that he has forgiven me and he will never leave me again, Am so full of joy for what this spell caster and to this product page and graphic love spell coz it really help and work for me, i also want the world to benefit from this. if you need his help you can reach him for any thing on relationship problem, getting your ex back save and protect your marriage life with your soul mate contact him now for he is so powerful and real. Thank you so much for the tips, I hope the work for me too! Attention all Pinterest users…here is a fantastic opportunity that I have just discovered. This company is willing to pay good money to people who know how to pin on Pinterest.